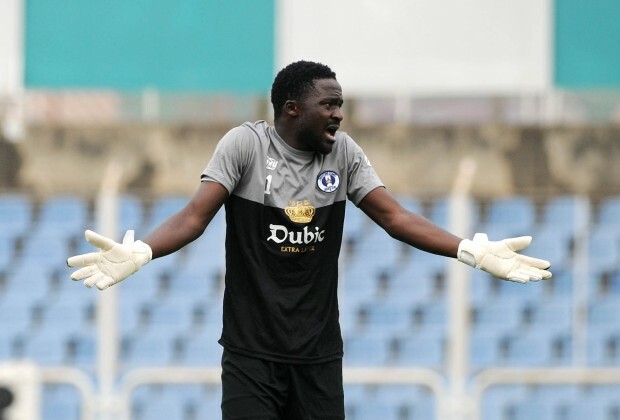 Super Eagles goalkeeper, Dele Ajiboye has downplayed been worried or under pressure with Okiemute Odah gradually establishing himself as a starter for Plateau United. Okiemute Odah has become the first choice since Ajiboye was away on international duty with Nigeria at the CHAN tournament in Morocco. In a chat with Brila.net, the former Under-17 World Champion said he is not thinking about the situation at all. “I’m not worried, It’s just a normal situation, I was on International duty and someone had to step in,” The CHAN Eagles star stated. “He’s having his opportunity now, and with time I will have mine” the player added. Dele returned to the Jos based side immediately after the CHAN but Okiemute Odah has been in goal in back to back games first against Eding Sports of Cameroun and also yesterday against Enyimba. Ajiboye, however, added that there is a good relationship between the goalkeepers and that he will also have his Fair share of games this season.